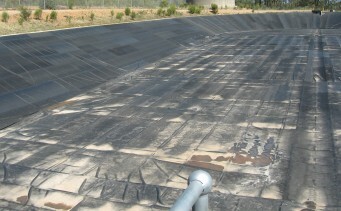 Membranes Australia manufactures dam linings ranging from small ornamental dams through to commercial sized water storage or effluent management dams. 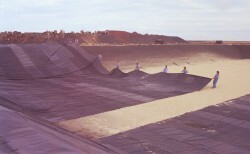 Our dam lining systems are designed on a per project basis. Liner panels are made to suit each project, with each individual panel being manufactured to a maximum weight of 1000 kilograms. Once the panels have been manufactured and transported to site, our specialist technicians use custom built vulcanising machinery to join the panels together. These joins are as strong as any factory produced join and only take a small amount of extra time to perform on site. Our portable machinery has been specially designed so it can be run off a standard 10 amp domestic power supply or small portable generator. There is no limit on the size or shape of the dam. As each project is assessed individually we can create the panels to suit your project and any logistical limitations that apply.